Visit Banteay Srei, loosely translated this means citadel of the woman but this is a modern appellation that probably refers to the delicate beauty of the carvings. The temple's relatively small size, pink sandstone construction and it's ornate design give it a fairyland ambiance. 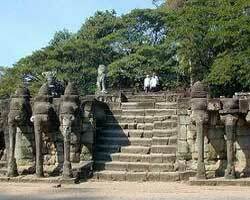 Visit Phimeanakas. The Kings Temple or Royal Temple. Legend has it that the golden tower or spire was inhabited by a serpent. 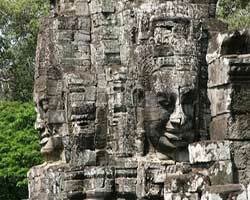 Bayon The giant stone face of Bayon have become one of the most recognizable images connected to the Khmer art and architecture. 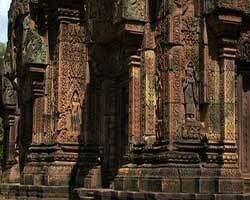 The best of Bayon are the Bas-Relifs on the exterior walls of the lower levels where the stone face resides. 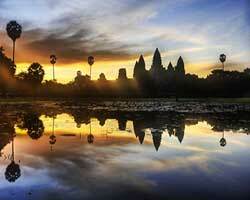 Visit the source of the stone which was brought to construct Khmer sanctuaries. 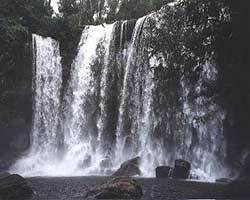 Phnom Kulen is the name of the large mountain from where the stone was delivered over 70 Kilometres away by the ancient Khmer, to build their sanctuaries. The top of it is river source which has its importance as an old capital. 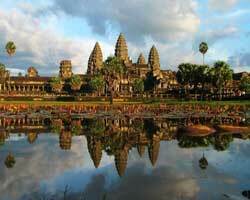 Visit, by boat trip to Tonle Sap, which is one of the largest fresh water lakes in the world. Floating fishing villages dot the semi submerged forest that lines the floodplain edges of the lake. This offers an excellent place to see lakeside, rural Cambodia and a unique ecosystem which is rich with bird and other wildlife. Visit to a morning market where you will find a wide variety of stalls offering a diverse range of goods and services in a hassle-free environment. 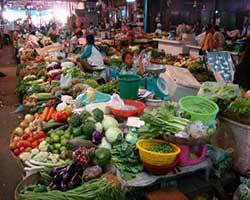 The market is unique in that not only do the naturally constructed stalls display good quality local wares but many are stocked with original items from outside Siem Reap. Arrive Poi Pet and proceed to the Cambodian - Thai border. From here you can choose to return Bangkok or Pattaya.